Take this Osprey Week Survey to let us know which trips you are most interested in. You're not signing up yet, just giving us feedback. Why you value this least—what about it DON’T you like? Get in groups with a mix of values as determined from your moral foundations quiz. How often do you step outside of your own “moral matrix”? Explain, discuss, perhaps provide an example or tell a story from your own experience. Why is it so hard to step outside of the moral matrix? Do you think this process of learning about moral values and the moral matrix can help to overcome polarization and bi-partisanship? Why/why not? How can you use these concepts in your own life? Fill out the chart on political parties and beliefs. Use your own knowledge, the handout Ashley has for you, the internet if it works and classmates. HINT…you might want to look at the Republican and Democratic political party platforms! Choose two of the issues from the list (they can’t be issues we have already discussed in class-- namely abortion, gay marriage and flag burning) and jot down what moral foundations you think the party uses to establish their position. If you KNOW you’re not interested in a political player role, just read the LAST role- it’s the default, unless you opt into something else. Honors students, you are REQUIRED to choose another role. We don’t have enough students to fill them, so if politics is your thing, I encourage you to step up! For non-honors students who choose a role other than the default, there is extra credit (if you do the role successfully and well). Let's read over the brainstorm document and guidelines for Phase 1 and Phase 2 research. If time allows, you can start working on Phase 1. HOMEWORK: By next Wed. Oct. 5th you will need to have Phase 1 done for class. Put your name under the name of the teacher you'd like to conference with about your senior project idea. They will then let you know when they can meet and schedule a conference with you. You need to have this conference sometime by Thanksgiving. You can't have your conference until your reflection and initial research is complete. How similar or different do you think liberals and conservatives are in terms of their morality? Where are the key differences? Where do they overlap? What is one issue about which you feel really passionate? What does your stance on the issue reveal about your core values? Scroll down to find the quiz entitled, "Moral Foundations" (you’ll need to register here to be able to take the quiz). When you’re done, copy the graph you get into a word document or google doc. You’ll need these results later! Okay, now let’s find out what these results mean. This guy is speaking to an audience of liberals, so you’ll notice that his rhetoric is pitched to them. HOWEVER…don’t let that fool you. His underlying point is actually criticizing the group for being so monolithic. Remember, he’s playing to an audience here. That doesn’t mean his underlying points are invalid. Partner Analysis: For each of the issues below, discuss where liberals stand and where conservatives stand. THEN, align those viewpoints with their moral values as we outlined in question 4 above. End with why you value that the LEAST-- what you don't like about it. This could be done as a satire. A situation/scenario/issue in which this value would be challenged and how that makes the character feel or how the character would react. What political issues or situations you would see that value most coming into play OR a personal experience in which you saw that value being challenged for you or others. Take the next 10 minutes to review for today's test. Issue Studies: Overview of each issue, followed by party caucuses to determine the general guidelines for your legislation. Issues we'll tackle this year are: Climate change/energy policy, College loans/tuition, and Immigration. How much do truth and fact matter in political opinions? How do different cognitive biases and other trends impact the information we’re exposed to and how we react to it? A note on today's lesson: May feel repetitive from Jmac's and my classes last year, but it does take a different twist AND is an important frame and foundation to launch us into our Model Senate work. Discuss: What’s the Big Sort? Describe it in as much detail as possible. Discuss: How do you see the big sort in Durango? In your own life? Think about the lifestyle markers he talks about, and what lifestyle markers you see around you! Try to give specific examples. How does being sorted that way impact the information you take in? Your political views? Highlight/underline phrases/words that particularly strike you. What is the main source where you get information about the world? What perspective does that source show you? What is “the Big Sort?” How do you see it in your own life? What is the message of the article “The Power of Political Misinformation?” How does it connect to you? Do you see this trend? How does “The Power of Political Misinformation” connect to the Big Sort? How do both of these articles/concepts connect to naïve cynicism? What implications do these articles have for democracy? Is there a way around the problems these articles pose? Are there solutions, or are we doomed to a misinformed life in a bubble? How does this connect to the debate? To what you observe in politics and our community today? If done early, continue studying for parts 2-4 of the exam. See yesterday's blog post for test prep strategies. Reminder that the in-class essay is tomorrow and the 3 other sections of the exam will be Wednesday. For the in-class essay, you may use your notes and any additional resources you found in your research but you have to write it in the time allotted (approximately 70 minutes). You may begin your thesis and outline but may not begin writing the actual essay until class tomorrow. To do so would entail academic dishonesty. About which sections of the test are you most concerned? In class essay, evaluating whether or not we need the VRA today. Checks and balances scenarios: I’ll give you a scenario, you explain what branch can DO the initial action, what branch can check them, and how they can check them. Everyone write a thesis statement that answers the question: Is the Voting Rights Act still needed? ​Is the stance the author is taking clear? Summarize their argument in your own words. Does this answer the question directly? If not, how could they make it more direct? Based on this thesis statement, what are three things you would expect to find in this essay? These could be arguments, themes, or specific pieces of evidence. List one thing the author could do to make this thesis better. List all the different checks that happened between legislative and judicial branch for the VRA. HINT: Look at the amendments and the Washington Post article about North Carolina’s recent voting law controversy! You might also draw out a diagram or FLOW chart to help you with this. First, try to draw the checks and balances diagram from memory. Don’t cheat here, this is to see how much you know, so you know what to study! ​Who has the power to DO the action? Who can CHECK this action? HOW do they check it? ​Scenario 1: Secretary of Defense dies in a chinchilla attack, and needs to be replaced. Scenario 2: A bill was recently passed to allow citizens to choose their own health care plan under Medicare. Scenario 3: The United States has signed a peace treaty with Iran. Scenario 4: The Supreme Court rules a recent law requiring all male citizens to wear clown noses unconstitutional. ​F. Essay Brainstorm: Hold a small seminar to hear other students' opinions on the essay prompt: Do we still need the Voting Rights Act? HOMEWORK: ​Study for the TEST!!! See above for study guide and strategies. Those of you who read the majority opinion of the court, pay attention to how John Oliver use of logical fallacies in covering the Supreme Court's decision. Be ready to point those out to your partner when you share out your research on the court's ruling. Mea culpa. It is the first time either Lori or I have taught Voting Rights and between gathering resources, and learning the content ourselves, we haven't had much time left over for thinking creatively about how to design lessons. So I get that it has been a bit dry. That said, I firmly believe this topic is SO important. It is not only one of if not THE biggest pieces of Civil Rights legislation and Supreme Court ruling but it also has the potential to dramatically impact you all as soon-to-be voters. Moreover, being able to read dense legal language as we've done is an important skill and will enable you to better decipher ballot measures and other laws. LASTLY, Lori and I both felt that by using the VRA of 1965 as a case study, you'd be able to better understand the way the three branches work and thus will be more successful moving into Model Senate. That said, moving forward, what types of class activities would you like to see me try to incorporate more? Review the reading from the end of class yesterday on the Shelby County v. Holder Supreme Court ruling. So, we've spent a good deal of time looking at the legislative branches role in VRA (passed all those Amendments) and now the Supreme Court (Judicial Branch) role in striking down Section 4 of the VRA. As you review, make sure you've summarized the main arguments of your assigned "sides" opinion AND selected the most powerful quote. Which opinion, in your view, is most convincing? Why? Predict what changes, if any, happen as a result of Shelby v. Holder. Mini-discussion: What do you think we should be more concerned with today? Voter fraud or voter suppression? *Voter fraud means people trying to rig elections, cast votes for dead people or vote more than once, or miscount ballot. *Voter suppression means restricting people's access to vote or preventing minority group's opportunities to elect a representative. RADIO SHOW (with transcript): http://thedianerehmshow.org/shows/2014-08-13/update-new-voting-rights-laws-across-country I HIGHLY RECOMMEND THIS ONE!!! What are some examples of changes that have been made that are making voting laws more restrictive? ​What are some examples of changes that have been made that make voting laws less restrictive? What did you learn about the new voter ID laws and voter fraud from your source? What else strikes you as interesting from your source? On balance, have voting laws become more or less restrictive in the aftermath of Shelby v. Holder? Based on the information you have now, do you think the Supreme Court made the right decision in Shelby County v. Holder? Why/why not? List all the different checks that happened between legislative and judicial branch for the VRA. HINT: Look at the amendments! Not everything is here, but some is! HOMEWORK: ​Study for TEST next TUESDAY!!! See above for study guide and strategies. 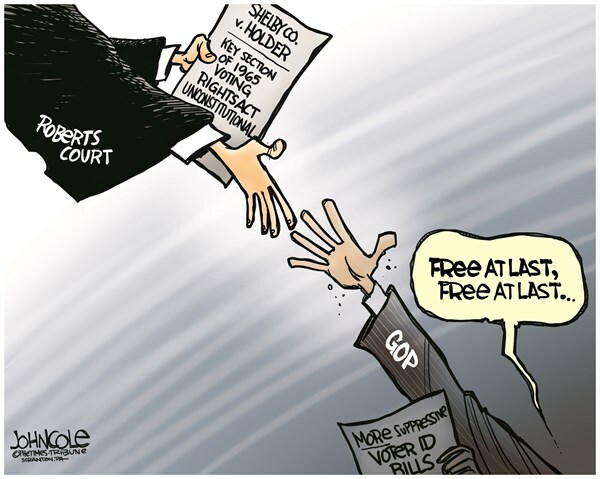 Based on this cartoon, work with your group to write down as many inferences as you can about the Supreme Court case Shelby v Holder. Think carefully about what different elements of the cartoon are telling you! Debrief, get predictions on the board. Just a friendly reminder that it is in your best interest to take solid notes and ensure complete comprehension of the concepts we're covering in class for next week's test-a-rooski! I will hopefully finish grading college essays by the end of this week(end). I'm not allowing rewrites for a new grade BUT I am certainly happy to continue to help y'all refine your essays! Just schedule a conference with me as needed. Honors-- are you in or out? Understand Amendments to the VRA of 1965 and evaluate trends/patterns in those amendments over time. Analyze the Supreme Court's ruling on Shelby County v. Holder in order to begin forming your opinion as to whether or not the VRA is still needed today. Each of you is going to be assigned one amendment (there are 5 total). In your expert group, read the summary of that amendment provided by Ashley. What did this do to the special provisions? How did this amendment expand coverage? What new provisions (if any) did this amendment add? For each of the points above, you should have a small and simple illustration that represents the main point of that piece of the amendment. Make it pretty! Make it clear!? Make sure you understand and can explain these things clearly to other students! Get in a group that has one student from every amendment. Now, as a group, identify at least 3 major patterns or trends that you see in these amendments. How did they make the Act different from the original? Summarize in your notes. After reading the summaries, how accurate were your predictions? What sections of the VRA did this Supreme Court decision leave intact? What sections were declared unconstitutional? Okay, now it’s time to dig into the actual arguments put forth by the Supreme Court. What was the reasoning of the majority? And why did the minority dissent? Write the most powerful quote from the justice’s opinion, and explain what it means, and why it is powerful. Wednesday, 9/21: Podcast and VRA Amendments! Form an opinion on Edward Bloom and others' tactics to use the judicial system to hear minority voices as well as on where you stand regarding yesterday's WaPo article on North Carolina's Voting Rights restrictions. Warning! Strong language here. Earmuffs may be needed if you are sensitive to occasional f-bombs. Do you think that individual states should have the right to decide their own voting policies? OR Should this be a federal issue? Do you think that this type of media contributes to naive cynicism? Explain. 1. Honors essay refinements due! Also-- tell me today if you're in or out! Checks and balances scenarios: I'll give you a scenario, you explain what branch can DO the initial action, what branch can check them, and how they can check them. Complete your notes on page 2 of the VRA Vocab and Summaries handout I gave y'all yesterday. Lost it? It's on yesterday's blog and on the Docs page of my dp. Ashley will put'cha into small groups as these will be your groups for an activity later in class as well. Don't freak out. It is only a small infringement on your liberties for me to choose your groups but it is good to work with different folks and hear different perspectives from time to time, eh? Plus, ultimately I'm the decider and I get to decide. Is Edward Bloom vs. 40,000 civil rights activists marching in the street a false paradigm? Is Edward Bloom carrying the standard for Civil Rights in America? To what extent? Do you agree that manufacturing legislation should be counted as a form of freedom of expression? Is this a legitimate pathway to contend with the problem of the Tyranny of the Majority? Where do you stand on the issues outlined in the Washington Post article about voter discrimination? To what extent should states have voter ID laws? What kind? (Click on this map of the U.S. that explains how to vote in each state for more ideas on the types of laws various states require. Scope out ColoRADo obviously). Is it time for the Voting Rights Act of 1965 to end? Is it no longer needed? ​If you missed class yesterday, you need to make up the Voting Rights Act of 1965 reading and response questions IN YOUR STARTER GOOGLE DOC! Honors-- essay refinements due tomorrow. Also, last day to tell me if you're in or out! What adjectives best describe your experience trying to read and comprehend the Voting Rights Act? What strategies did you use to help you understand it? How successful were there? Are there any strategies that you didn’t use that could have helped? Which of these sections did you think was most important today? Why? The United States Court of Appeals for the Fourth Circuit: One of twelve regional appellate courts within the federal judicial system. The court hears appeals from the nine federal district courts in Maryland, Virginia, West Virginia, North Carolina, and South Carolina and from federal administrative agencies. NeoConservatism: a political movement born in the United States during the 1960s among Democrats who became disenchanted with the party's domestic and especially foreign policy. Neoconservatives typically advocate the promotion of democracy and promotion of American national interest in international affairs, including by means of military force and are known for espousing disdain for communism and for political radicalism. Ashley to post the map of U.S. with stats on how to vote in each state and show the embedded video above IF internet is working. What are the various arguments FOR and AGAINST North Carolina’s Voter ID Laws? Which pieces of evidence in this article are more convincing to you and most inform your position? Summarize, to the best of your ability, the legislative and judicial processes that have been involved in shaping North Carolina’s voting laws since 2010. What questions do you have about those processes? What did Edward Bloom and his wife discover about districts when they were campaigning? What was Bloom’s “beef” with the way districts were created? What was Plessy v. Ferguson? What was the Supreme Court’s ruling on the NAACP v. Virginia case on manufacturing litigation? Today's Goals: Understand the historical context on Voting Rights Act as well as what the Voting Rights Act of 1965 actually was..
Starter 10: Let’s look at one modern day example of voter disenfranchisement: “Why Virginia’s Restoration of Voting Rights Matters”- The Atlantic video. How is felon disenfranchisement related to Jim Crow? Do you think felons should have the right to vote? Why or why not? Still need to submit your DP link with Writing Goals to me? You have until Friday to get it in for 80% credit. 3 Branches diagram? You have until Thursday to submit that. Summarize what we learned in class on Friday. You may revisit my DP if needed! What stood out to you about the Jim Crow era events? 4 Corners: Voting discrimination is still very common today. Now, let’s take a look at the actual Voting Rights Act of 1965! You should work in groups to help you figure this out--use the significant brainpower in this room! Answer these in your starter google doc. Summarize. In the margins of the document or on a separate piece of paper, summarize the main idea of each “section” of the act. Put it into your own words! Vocab. Look up any words you don’t know! Write their definitions in the margins. Amendment. Which Constitutional Amendment laid the groundwork for this Act? What does that Amendment say (in plain English)? Confused? Try to research any remaining confusions/questions your group has! Ask Lori if you really can’t figure out what the heck a certain phrase/section means. Evaluate. Which of these sections do you think is most important today? Why? Discuss. Discuss responses to Voting Rights Act and any sections y’all still just don’t get. HOMEWORK: Finish Voting Rights Act reading and response questions IN YOUR STARTER GOOGLE DOC. !